LA CENTER — In an effort to help support two remaining card rooms in the city of La Center, members of the La Center City Council voted Wednesday night to approve changes to the city code that allowed for agreements to be signed with each card room that establishes a sliding tax scale. The vote was a culmination of a series of meetings and proposals that began last year to help keep the city’s card rooms in business. In October of 2017, members of the city council failed to pass an ordinance that would have reduced the tax rate on card room revenues from 10 percent to 5 percent for the last three months of the year. At Wednesday’s city council meeting, financial consultant Paul Lewis presented proposed changes to city code and an agreement between the city and the card rooms that would establish a sliding tax scale for the businesses during 2018. Lewis began by explaining the importance of the card room industry to the city of La Center. Historically, the revenues from the card rooms have made up over 75 percent of the city’s annual general fund. However, in 2017 the revenues from the Last Frontier and Palace casinos decreased to 62 percent of the general fund, and 2018 budget projections estimated that the revenues would be only 51 percent, Lewis said. Lewis attributed this decrease to several factors. 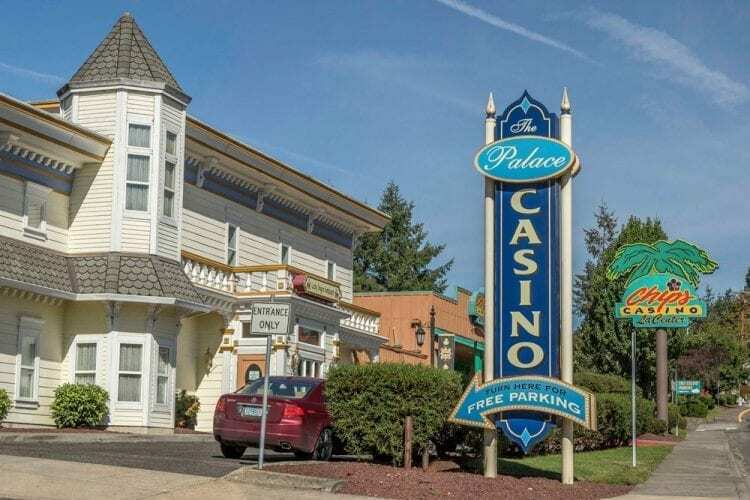 Increased competition from the Cowlitz Tribe’s ilani casino, as well as a card room in Woodland, have decreased the amount of customers at the La Center card rooms. Additionally, incremental state minimum wage increases to $13.50 an hour by 2020 have not only increased the wages for minimum wage employees, but also increased costs for the card rooms when they have to increase other wages to maintain the pay scale. Lewis characterized the industry as a “labor intensive business,” with each card room requiring an estimated 300,000 hours of labor per year. Lewis estimated that if one half of all hours were affected by the wage increase, it would cost each business about $328,000 annually. Lewis also said that requirements for paid sick leave and medical insurance under the Affordable Care Act have driven up costs for the card rooms. According to his estimates, Lewis said that the combined total of the wage and benefits increases cost each card room approximately $500,000 annually. For the first several months of 2017 before the opening of the ilani Casino, Lewis noted that the card rooms had comfortably high revenues. However, although the 2017 tax revenue of $2,395,000 exceeded the city’s budget estimate for the year by $465,000, after the ilani Casino opened, the average monthly revenues of the card rooms dropped. From May to December of 2017, the average monthly revenues from the card rooms was $850,000, which Lewis said matched the card room revenues for the same period in 2014. Lewis also situated the tax rate of La Center with other cities in the state. Taxes in the state run from 2 percent to 11 percent, with La Center’s original rate being set at 10 percent. Lewis said that several other cities have recently reduced their gambling tax rate. Spokane Valley reduced it from 10 percent to 6 percent, Spokane from 8 percent to 2 percent, Woodland from 5 percent to 3 percent and Moses Lake from 10 percent to 5 percent by 2022, with annual 1 percent decreases. The council first decided on changes to the city’s gambling tax ordinance. The ordinance adopted specifically authorizes the mayor to sign agreements with each card room that establish tax structure changes effective until Dec. 31, 2019. The ordinance also establishes reduced late fees for tax payments. It also references state law and establishes that in the event of nonpayment, the taxes are considered a priority lien against property used in the card room trade. The late fees have been reduced from 5 percent to 2.5 percent for 1 to 10 days, 10 percent to 2.5 percent for 11 to 14 days, 10 percent to 5 percent for 15 to 20 days, 15 percent to 5 percent for 21 to 31 days and 20 percent to 10 percent for over 31 days. The fee for the first 14 day late payment also is waived by the ordinance changes. Under the agreements specified by the ordinance changes, a sliding tax scale for monthly revenues is applied to the card rooms. For revenues up to $400,000, the marginal tax rate is set at 5 percent. Revenues of $400,001 to $700,000 have a marginal rate of 7.5 percent. Revenues from $700,001 to $1,000,000 will have a rate of 10 percent. Revenues from $1,000,001 to $1,300,000 are taxed at a marginal rate of 12.5 percent and revenues in excess of $1,300,001 are taxed at 15 percent. The agreement also establishes a 5 percent tax rate extending up to $800,000 for April through June, to help offset impacts on the card rooms from road construction in the city and the impacts of the full implementation of city utility taxes. The ordinance also establishes payments to be charged in the event of a card room closure. Before June 30, a closing card room would owe $25,000. Closure from July to Oct. 31 renders a fee of $15,000. The city also must be notified of closure within one hour for permanent closure and two days ahead of a temporary closure. Lewis said that if the average gross revenues for the card rooms is $850,000 per month in 2018, the effective tax rate would be 6.8 percent. The additional reduction from April to June would create a 6.5 percent effective rate. This equates to an approximately 32 percent to 35 percent reduction in the tax. The card rooms would thus save an estimated $360,000. Under the plan, the city’s revenues are estimated at $1,329,000, and increase the deficit by $243,000. The current budget deficit is $390,000, and the new tax plan increases that to $633,000. Members of the city council voiced approval for the measure. Council Member Joe Valenzuela emphasized the historical importance of the card rooms to La Center. Since the 1980s, over $40 million were contributed to the city by the card rooms, he said. That revenue has provided for many excellent municipal services, the park and the police department, Valenzuela said. “It’s a gift that they’re here,” he said, offering support for the measure to keep them in business. Council Member Doug Boff asked what would happen if one of the card rooms were to close. “We’re not in a position to take that risk,” he said. Boff also pointed to three months of late payments from the card rooms as a sign of their financial difficulty under the current structure. “We need to preserve the health of these card rooms,” said Council Member Jon Stimmel, while the city works to find a long term solution to reduce its dependence on the card rooms. Public testimony at the council meeting was largely in favor of the tax changes. Chris Swindell, general manager of the Last Frontier, thanked the council members for their consideration of his business. “I know it’s important that we work together,” he said, to keep the card rooms afloat. Nelda Perryman and Suzi Terrell, however, both expressed a desire for the council to not approve the tax changes. They both cited instances where they alleged tens of thousands of dollars had been spent on projects advocated by Mayor Greg Thornton with little result. Both expressed concern as to how the city was being run. Terrell said that the mayor has only supported the Last Frontier Casino, and done little to support other local businesses. She also said that the reduction would be the first in a series of further tax cuts in the city. The changes to the city ordinance were approved by a unanimous vote of the city council. Once the ordinance was approved, the council voted to give the mayor the authority to sign agreements with both card rooms establishing the new tax structure. This passed unanimously as well. Under the new tax system, the changes apply retroactively to Jan. 1, 2018, and the agreements are in effect until Dec. 31, 2018, at which point the tax rate will revert back to 10 percent if a new agreement is not signed. The text of the ordinance is available here. The text of the card room agreement is available here.